Page added in May 2010. The Syrian village of Nabi Houri (Prophet Houri) is located immediately south of the border with Turkey which was established in the 1920s; because in the area the border is closed, the road leading to the village is a dead end and it is very poorly maintained. 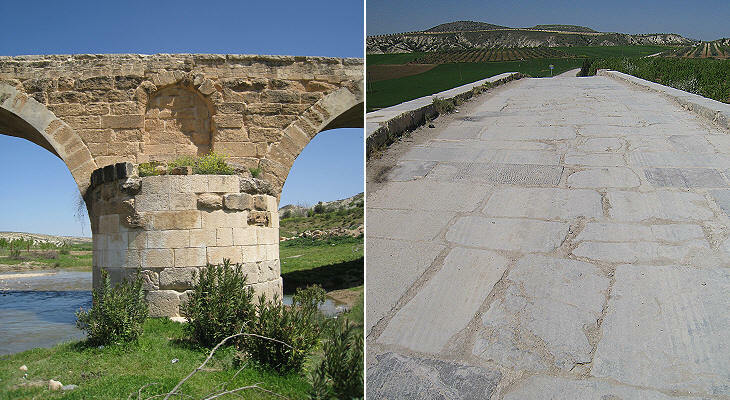 Given the condition of the road the view of an imposing ancient Roman bridge comes as a surprise, also because the small stream it crosses does not seem to require such a large bridge; most likely it had a celebratory aim in addition to its practical objective and the niches housed statues; it announced to travellers that they were about to reach Cyrrhus, which at the time the bridge was built (IInd or IIIrd century AD), was an important and wealthy town. 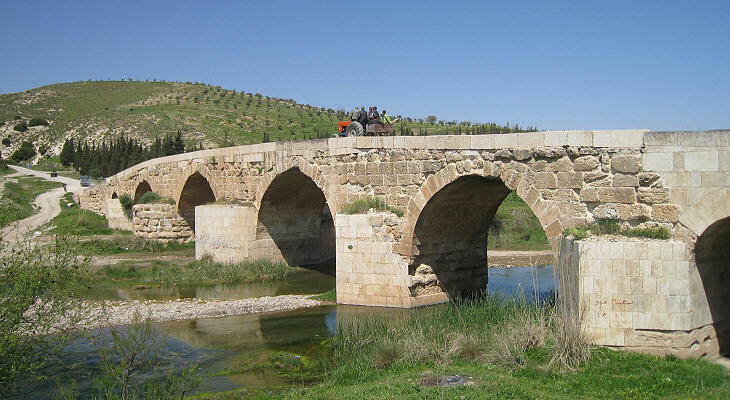 The bridge shows typical features of Roman engineering such as the boat-like shape of the structures supporting the arches and the paving of the bridge with large flat stones. 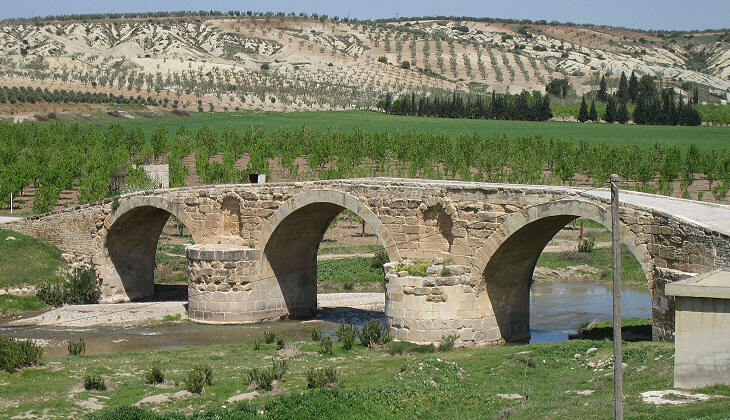 A second slightly longer but less imposing bridge crossed another minor stream very near the entrance to Cyrrhus; it shows some signs of restoration, but overall it is well preserved and it bears weights which exceed those for which it was tested. From the inscriptions found in tombs outside Cyrrhus and from the observation of its ruins (lacking an imposing forum) archaeologists believe that the town was mainly a military one; this makes even more surprising the hexagonal shape of the mausoleum shown above which is located at a certain distance from the walls of the city. Isolated ancient buildings were almost always oriented towards the cardinal points: they very rarely had a hexagonal shape because this polygon does not allow showing sides towards all cardinal points, but only towards two of them; for this reason octagonal buildings are much more common. 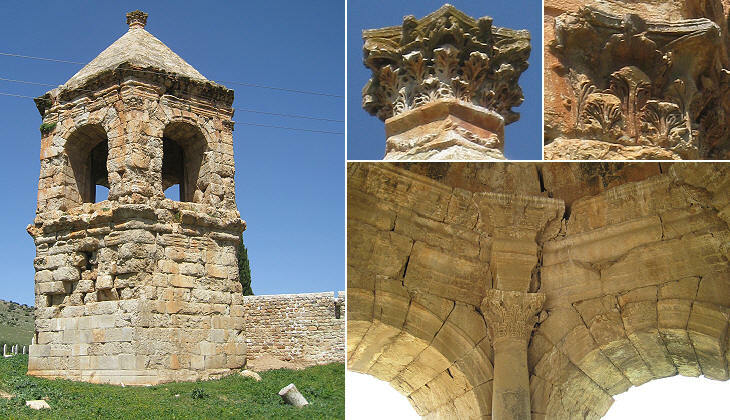 The other surprising feature of this mausoleum is the hexagonal capital on the top of the roof which resembles the baroque top of S. Giovanni in Oleo by Francesco Borromini. The monument is very well preserved also because from the XIVth century it houses the tomb of a much respected local religious leader. The site of ancient Cyrrhus has been excavated by French archaeologists, but there is no evidence of activity in recent years, nor is there any kind of control/protection of the ruins; the town was founded by the Seleucids, the kings of Macedonian origin who ruled over Syria until Pompey conquered it in 64 BC. 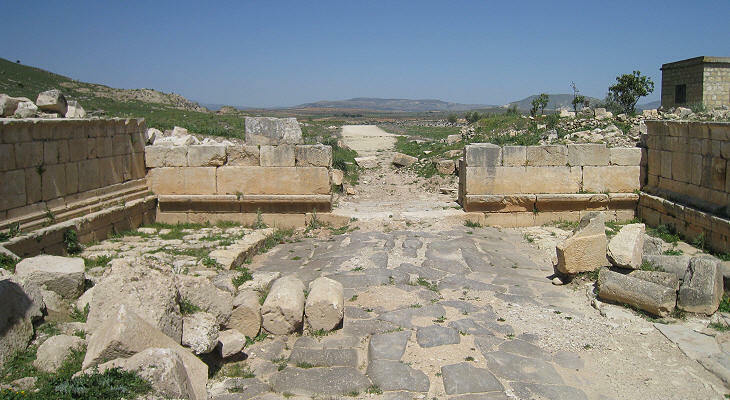 The plan of Cyrrhus was characterized by a long cardo, a north-south oriented street which crossed the whole town. 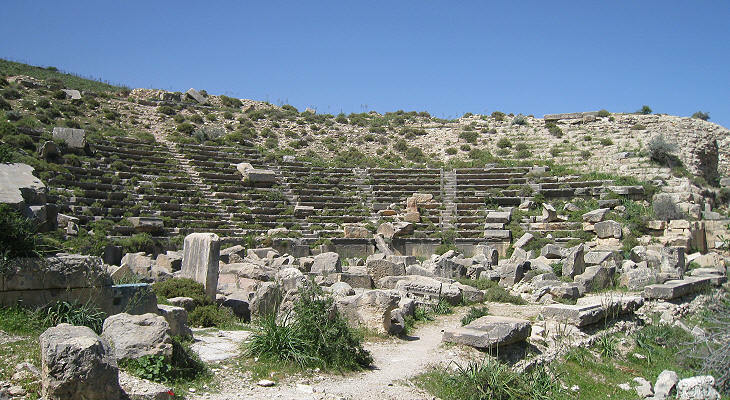 The size of an ancient theatre is always a good indicator of the size of the entire town; that of Cyrrhus is the largest one in Syria after that of Bosra; the town was not very near the border with the hostile empire of the Parthians, but the presence of a large garrison was justified by the need to protect the region from raids by the nomadic tribes who lived in the steppes and deserts of eastern Syria. The Romans made major efforts to expand farmed areas in the country and thus strengthen their control of the territory. 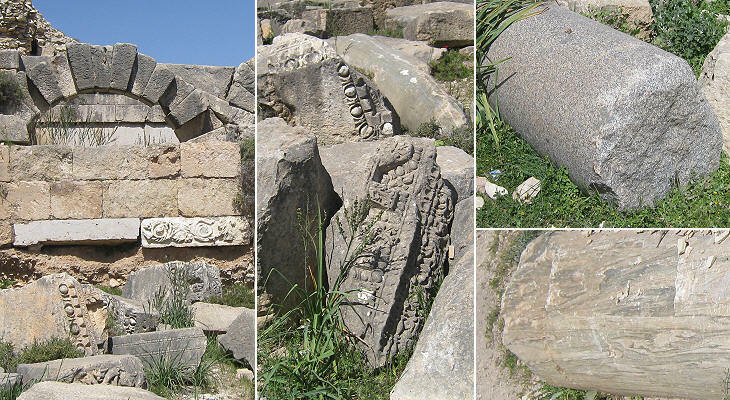 The theatre and some adjoining buildings show evidence of a rich decoration which included the use of stones brought from Greece and Egypt; however there is a lack of reliefs showing human beings and animals; a characteristic which can be observed also in Byzantine monuments of the region and in the strict compliance with religious rules of Mameluke monuments of Aleppo. Apparently the Hellenistic drive for the representation of the human body was not fully absorbed by local cultures. Cyrrhus has a place in Christian history because the relics of Sts. Cosmas and Damian were buried in a basilica of Cyrrhus and because Theodoret, the bishop of the town, played a major role during the Nestorian controversy, attended the Council of Chalcedon in 451 and wrote a life of St. Simeon the Stylite. In the VIth century a Byzantine citadel was built on the top of the hill behind the theatre; probably with material taken from the town. The Roman Catholic Church has still a bishop see named after Cyrrhus. Cyrrhus was conquered by the Arabs in the VIIth century; it was than retaken by the Byzantines, conquered by the Seljuks and shortly after by the Crusaders who included it in the County of Edessa (Urfa). 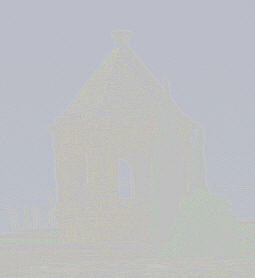 In 1150 it was conquered by Nour ed-Din, but according to chronicles it was already almost entirely abandoned.